In an earlier incarnation of the novel, Felipe (originally known as Rafael), had his own chapter. 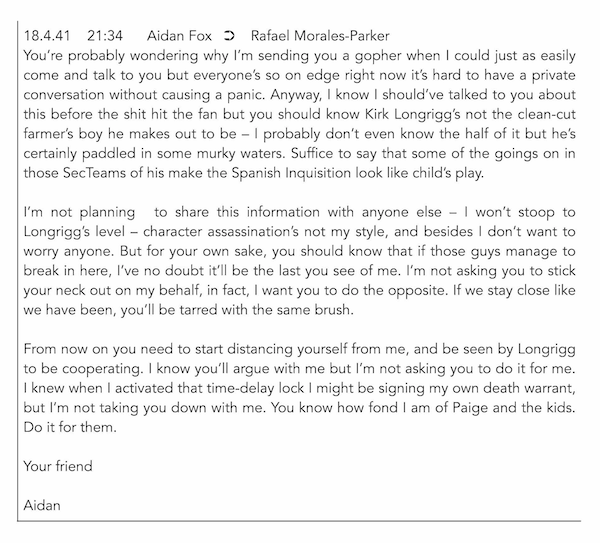 When I first had the idea for Aidan to leak hints about Kirk’s dark past, I thought he might do it through Felipe/Rafael. When I decided not to give Felipe such a starring role in Book One, someone else had to be the vehicle for Aidan’s rumour mongering – a burden which fell to Etienne. Annabel Smith is the author of two other novels: Whisky Charlie Foxtrot and A New Map of the Universe. She is a member of the editorial board of Margaret River Press, an Australia Council Creative Australia Fellow, and holds a PhD in Creative Writing from Edith Cowan University. She is currently working on an epic quest with a science-fiction twist, in which a trio of unlikely heroes must unite to overthrow a sadistic cult before a tsunami destroys their city. Thank you for visiting the world of The Ark. To explore further, buy the book, browse the fan fiction or create your own visual, audio, video or text-based document to add to the story.